Carnival of Space #147 is here. Carnival of Space #147 is now up at Bruceleeeowe's Blog. There's why you shouldn't nuke asteroirds, 3D galaxy Mpas, much ado about Phobos and much, much more. Head on over there now! The Last Quarter Moon is Tuesday April 6. Mars comes within binocular distance of the Beehive Cluster again. Saturn is seen in the evening above the eastern horizon near the bight stars Regulus and Spica. Venus appears low in the twilight. Jupiter is visible in the morning sky. Evening sky looking North showing Saturn, Mars and the Moon at 10:00 pm local daylight saving time (9:00 pm non-daylight saving) on Sunday April 4. Click to embiggen. The Last Quarter Moon is Tuesday April 6. On Sunday April 4 the waning moon is close to the red star Antares in Scorpius. Saturn is rising around 6:30 pm local daylight saving time and is easily visible in the late evening sky as the bright yellow object between the bright stars Regulus and Spica. Saturn was at opposition, when it was at its biggest and brightest, on Monday March 22. However, now is still a very good time for telescopic observation of the ringed world. On the 8th, Saturns' Moon Titan cruises just above the planets north pole. However, it is best to wait until 11 pm or midnight, when Saturn is quite high in the sky for the best telescopic views. Saturn's' rings are opening, and look quite beautiful, even in a small telescope. If you don't have a telescope, now is a good time to visit one of your local astronomical societies open nights or the local planetariums. Bright white Venus continues to rise above from the twilight glow. People with flat, level horizons can see Venus above the western horizon half an hour after Sunset. 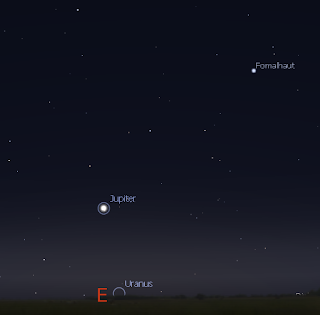 Jupiter is now relatively easy to see in the morning sky, above the eastern horizon. Jupiter stars the week so close to the dim star Phi Aquarii that on April 1 it will look as if it has swallowed the star. During the week it pulls away. Eastern horizon showing Jupiter at 5:30 am local daylight saving time (4:30 am non-daylight saving) on Sunday April 4, click to embiggen. In the evening Mars can be seen low in the northern sky as the brightest (and clearly red) object in that part of the sky. 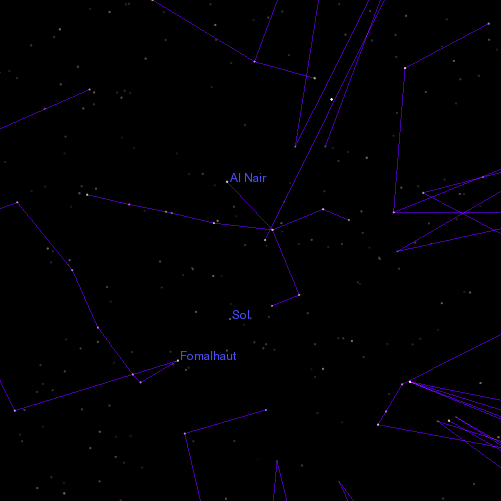 Red Mars is in the constellation of Cancer, nearly 3/4s of the way between Pollux and the Beehive Cluster. 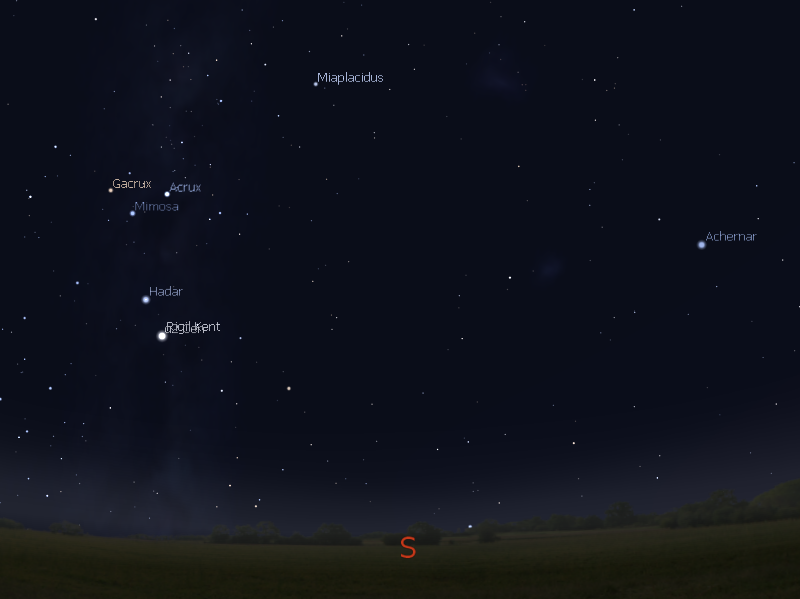 On Saturday April 3, mars comes within binocular distance of the beautiful beehive cluster. Mars also forms a line with the bright stars Sirius and Procyon. 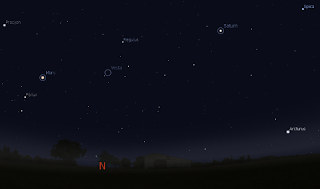 Mars forms another line with Regulus, Saturn and Spica. Don Machholz has just found his 11th comet! In the days of robot comet searches this may not seem much, but it represents years of searching the heavens by eye. You can read the story of his discovery here. The Full Moon on March 30th at 21:00 AEDST, similar views elsewhere in Australia at equivalent local time. The Full Moon is Tuesday March 30 (for Australians). This is a "Blue" Moon, in modern terms the second full Moon in a month. We also had a "Blue" Moon in January. "Blue" Moons roughly occur once every 2.5 years, but to have two in the same year is rarer, roughly once every 20-25 years. Unlike in January, when the Moon was the biggest it will be this year, this Moon will be fairly ordinary. 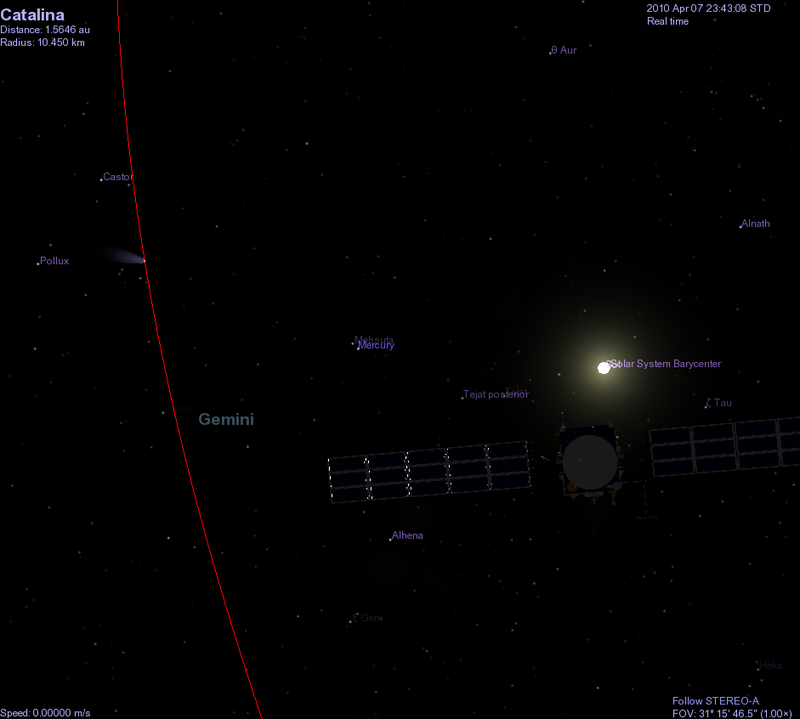 Comet C/2009 O2 Catalina as seen from Stereo A (visualization via Celestia). Bah, Humbug. Earth Hour was clouded out, both the Global-rent-a-scopes were closed up due to bad weather and there was nothing in the STEREO images of note. However, in a couple of weeks time comet C/2009 O2 Catalina will pass through the field of view (FOV) of the STEREO A spacecraft. This should be interesting, as it may be brighter than Earth based telescopes (currently mag 9). I think I can hang out for that. Hat tip to CometAl for finding that Catalina goes through the FOV of STEREO A. What can you do during Earth Hour? 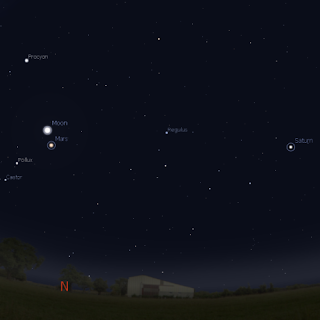 Northern Horizon on Saturday March 27 at 8:30 pm local daylight saving time in Australia (click to embiggen). At 8:30 pm on Saturday 27 March thousands of people will turn their lights and other electrical equipment off for Earth Hour. What can you do in the dark? Well, you know my answer to that … go out and look at the sky! If you have an old telescope lying about, or a pair of binoculars, go grab them and dust them off. Why not hold an Earth Hour Star Party? For us urbanites and suburbanites the sky won’t get particularly dark during Earth Hour, partly because essential lighting will stay on and partially because the Moon is nearly ¾’s full. However the sky will still be great to see. To the north, the waxing moon is just above Regulus, the brightest star in Leo, the Lion (see above image). The Moon is always fantastic in binoculars or a telescope; indeed, you may spend all of Earth Hour moon gazing if you are not careful. To the east of that the next brightest object is Saturn; you may need to wait a bit for Saturn to be higher in the sky before using a telescope on it. To the west is bright red Mars (sadly a small featureless disk in most small telescopes at the moment) and the stars Castor and Pollux of Gemini. Mars, Regulus and Saturn make a long line in the sky. The brightest star in the Sky, Sirius, and bright Procyon below it also form a long line with Mars. To the West, Orion the Hunter and his belt (the saucepan to us Aussies, young men dancing to the Boorong people) can be seen clearly, below that is the V-shaped group of stars that make up the head of Taurus the Bull wit the baleful red star Aldebaran as its eye. If you are lucky to have a clear, level horizon you can see the Pleiades Cluster twinkling above the horizon. To the South, you can see the pointers showing the way to the Southern Cross. Above the Cross is the rambling constellation of Carina, the keel of the mythical ship Argos. There are lots of small beautiful clusters in the sky here. With the Moon so bright, they will not be prominent, but sweeping around with binoculars will find many delightful groups of stars. You may even find the Tarantula Nebula! Being an amateur astronomer I can't help being fascinated by light in all its its manifestations. Here the low morning sun is reflection of a sculpture made of interlinked mirrored diamonds, the patterns of reflected light are terrific. Ada Lovelace Day is an international day of blogging to celebrate women in science, technology, and engineering. Details over at The Panda's Thumb and read the 2D goggles webcomic on the topic (read the whole 2D goggles thing anyway, it' s fantastic). 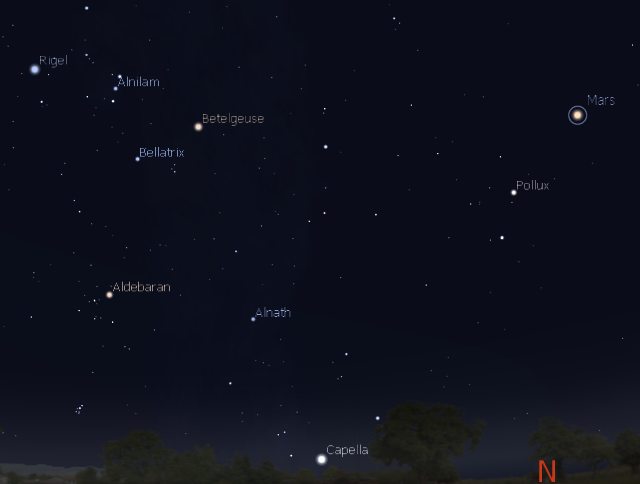 As mentioned in the Advertiser article in EducationNow, I'm a fan of using the freeware programs Celestia and Stellarium in astronomy education. To demonstrate this, I've made a Celestia script that takes you on a trip to three exoplanets (Epsilon Eriadanus b, Super Earth Gliese 851 d, and 47 Ursae Majoris b) showing what the Sun and the constellations Scorpius and the Southern Cross. Like these posts. The script (download ExoplanetSkies.cel and put it in your Celestia folder, then use File | Open Script to run it.) will take you on this tour while showing some basic information. At the moment, the descriptions are somewhat terse (and I haven't included music), and I really should put together a teachers guide so teachers can get students asking questions and develop some points that would be too wordy to include in the script. But this gives you a flavor of the power of scripts. If you have Celestia Versions 1.3-1.5 you will have to download the file Wolf_562.ssc (the alternate name for Gliese 581) and put it in your Celestia extras folder. You then have to comment out Gleise 581b which is in these versions. Celestia 1.6 has the full Gliese planet set. Anyway, download the script, give it a whirl and tell me what you think (ho to improve it for teaching etc.). Carnival of Space #146 is here. Carnival of Space #146 is now up at Simoastronomy. There's VirginGalactic, where Space Shuttles go when they retire, laser power beaming, getting honking big payloads into space, Name That Crater, the search for water ice on the Moon, gravity wells and Lagrange Points and much, much more. Put some ice cubes in your drink and sling on over. G'Day to everyone who has turned up after reading the Advertiser article on Science Blogging by Claire Peddie in EducationNow. 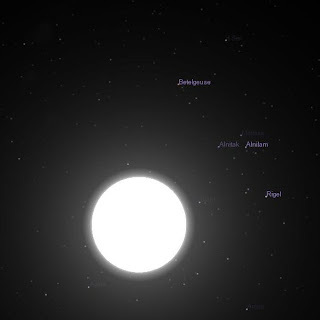 If you are interested in Stellarium and its scripts, see this series of Stellarium posts, if you are interested in Celestia and its scripts, see this series of Celestia posts. Otherwise, just look around and see what you can learn about the night sky, science and all sorts of stuff. And G'Day to everyone who has turned up from Pharyngula, come on in and enjoy the astronomy, pharmacology and climate change posts. My evolutionary biology gets posted at the Pandas Thumb. The Full Moon is Tuesday March 30. This is a "Blue" Moon, the second of the year (a rare event). Mars has faded but is still easily visible. Saturn is seen in the evening above the eastern horizon near the bight stars Regulus and Spica. Venus appears low in the twilight. Jupiter is visible in the morning sky. 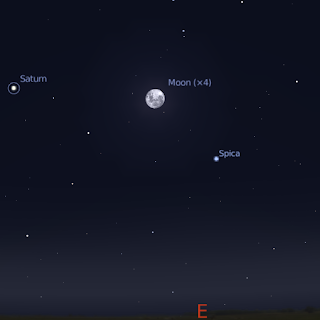 Evening sky looking North showing Saturn, Mars and the Moon at 10:00 pm local daylight saving time (9:00 pm non-daylight saving) on Thursday March 25. Click to embiggen. The Full Moon is Tuesday March 30. This is a "Blue" Moon, in modern terms the second full Moon in a month. We also had a "Blue" Moon in January. "Blue" Moons roughly occur once 2.5years, but to have two in the same year is rarer, roughly once every 20 years. Saturn is rising around 7:30 pm local daylight saving time and is easily visible in the late evening sky as the bright yellow object between the bright stars Regulus and Spica. Saturn was at opposition, when it was at its biggest and brightest, on Monday March 22. However, now is still a very good time for telescopic observation of the ringed world. The Moon is near Saturn on Monday, March 29. On the 30th-31st, Saturns' Moon Titan cruises just under the planets south pole. 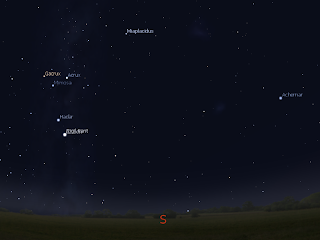 Jupiter is now relatively easy to see in the morning sky, above the eastern horizon. During the week, Jupiter comes close to the dim star Phi Aquarii, and on April 1 it will look as if it has swallowed the star. 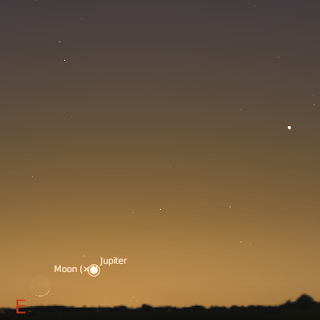 Eastern horizon showing Jupiter at 6:30 am local daylight saving time (5:30 am non-daylight saving) on Wednesday March 31, click to embiggen. In the evening Mars can be seen low in the northern sky as the brightest (and clearly red) object in that part of the sky. Now is still a good time to look at our sister world in a telescope. Shortly before 9:30 pm local daylight saving time (8:30 pm non-daylight saving time) Mars is at is highest in the sky, this is the best time to look at Mars in a telescope. Mars is a distinct nearly full disk in a small telescope, although somewhat small. Larger telescopes will be needed to distinguish surface features. Red Mars is in the constellation of Cancer, nearly halfway between Pollux and the Beehive Cluster. Mars also forms a line with the bright stars Sirius and Procyon. 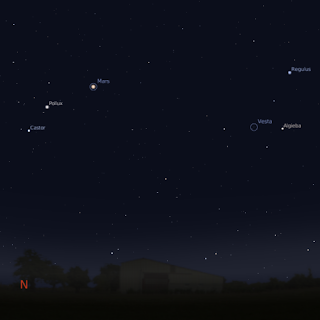 Mars forms another line with Regulus, Saturn and Spica. On Thursday March 25 the waxing Moon is close to Mars. Way back in prehistory, when the world was young and the TalkOrigins archives were less than a megabyte, Ted Holden dubbed the denizens of the USENET forum TalkOrigins “Howler Monkeys”, this was taken as a badge of pride, and any meeting of TO contributors was dubbed a HowlerFest. This weekend some of the old TO regulars, myself, John Wilkins, Chris (“how can he be trusted”) Nedin, Jim (Hominid FAQ) Foley and Chis Ho-Stuart met with PZ Myers in Canberra for an antipodean Howler Fest. We don’t contribute much to TO these days, but we are all still active in appreciation of science, and combating pseudoscience and have our own blogs, or blog at the Panda’s Thumb collective (which grew out of TO). There was much eating, drinking of caffeinated beverages and some beer called Venom, appreciation of Dickensonia Rex and talking. Lots of talking about a diverse range of subjects (science, pseudoscience, global warming, religion, whose politicians were most insane). Chris and Jim had us take over their living rooms and bedrooms without complaint as we all talked late into the night (and let me say Chris’s couch is very, very comfortable). I won’t talk too much about this, as Professor SteveSteve will blog the meeting over that the Panda’s Thumb, apart from saying we single handeledy increased coffee sales in Canberra that weekend. However, I do want to recount one incident. People forget that Prof Myers is a developmental biologist, and does experiments with Zebra fish. I work on Alzheimer’s disease, and work with some colleagues on Zebra fish looking at toxicity models. PZ had discovered that a certain free radical scavenger had an interesting and unexpected effect on development; we had found a structurally different free radical scavenger had a similar and unexpected effect on development. We blinked at each other for a moment. Now I’m going to use his scavenger in my experiments next week, and he’s going to use my scavenger in his experiments. Science is fantastic! Cross seeding of ideas can come from almost anywhere! Opposition of Saturn 22 March 2010. On Monday, March 22 2010 Saturn will be at opposition. An opposition is any time the earth is directly between an astronomical object and the Sun. At this time, Saturn is the closest to earth and at its biggest and brightest as seen from Earth. Unlike Mars where the variation in its orbit means the size and brightness and location of Mars changes dramatically, the variation in Saturn is more subtle. Seen with the unaided eye, Saturn is a modestly bright yellowish object almost midway between the bright white stars Regulus (the brightest star in Leo) and Spica (the brightest star in Virgo). Brighter than both those stars, Saturn forms a straight line with them and the bright Red Mars. On the 25th, 27th, 29th and 31st the waxing Moon visits Mars, Regulus Saturn and Spica in that order, so if you are unsure, you can use the Moon as your guide. 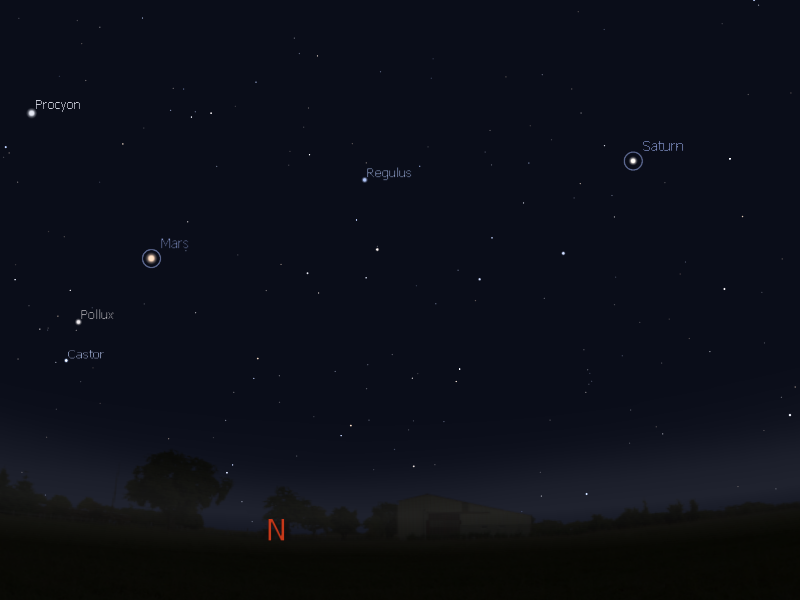 Over a month, Saturn will move very slowly, heading slightly towards Regulus. In good high-power binoculars (10x50 or bigger) Saturn appears as and elongated disk, it is clearly not circular, but you cannot distinguish the rings. However, even in small telescopes, Saturns’ rings are distinct and enchanting. In larger telescopes they are spectacular. Saturns’ rings are opening up, after being edge on last year. While you won’t get the full glory of the rings compared to when they are most open, the rings are still an amazing sight. The telescopic view will repay many nights of observation. Sturn as seen through a telescope on March 22 at 11 pm daylight saving time. Saturns’ Moons can be interesting to follow too. In small telescopes, Titan is the only Moon readily visible, on the 22nd and the 30th, Titan will drift close to Saturns’ poles, and will be quite worthwhile following. For those with large telescopes, the dance of the smaller moons can be seen. You may wish to use you sketching skills to draw Saturn and Titan in theuir various aspects. If you don’t have a telescope, why not take advantage of your local astronomical societies or the local planetariums open nights to view the ringed world. Unlike Mars, which shrinks rapidly after opposition making surface markings hard to see, Saturn will be well placed for viewing for some time, so you will have plenty of opportunity to see it. Over at Spaceweather there are images of yet another comet that has come too close to the SUn and evaporated. CometAl has far better pictures though via the STEREO satellite, pop on over and have a look. Correspondent Alan Garde pointed me to this cool unexpected rainbow at Spaceweather (you will have to scroll down to see it, but a high resolution image is here). Not only has the glass of the bus stop acted as a prism to produce a spectrum, but you can also see the Fraunhofer lines in the spectrum. I've never seen this before, maybe you need a particular intensity of spectrum to see them, but I'm going to be scrutinizing unexpected rainbows very closely now. Carnival of Space #145 is here. Carnival of Space #145 is now up at Crowlspace. We have crafty telescope builders, handling real bits of the Moon, how impacts form, the 150 kiloton Jules Verne Nuclear Cannon (seriously), volcanoes on Io and much much more. Shoot on over and have a read. Cower in Terror....Only not right now. Passed on by commenter JupiterIsBig. Be afraid, be .. somewhat afraid.. for the star Gliese 710 is hurtling our way and will cause a lethal hail of comets in .. well.. in 1.5 Million years. I'm not starting building the impact shelters yet. By the time it comes close we will probably be able to move stars around at will anyway (or be long extinct, one or 'touther). What does this demon star of doom look like. Well, if you could see it from Australia tonight, (which you can't as it is below the horizon), you would need a small telescope to see the inauspicious magnitude 9.2 star just below eta serpens. It may look harmless now, safely 63 light years away, but whoompph! By a mere 1.5 million years it will be within 1.1 light years and will wreak havoc with our Oort cloud and Kuiper Belt, causing an umm, maybe a 5% increase in comet impacts? Yes, I'm shaking in my boots. The abstract of the paper is here, and the full paper here. *sadly, tragically, you can set the date to 1.5 million years ahead in Celestia, but it doesn't move the stars according to their radial velocity. I'll try and come up with a fix. Sooo, posts may not be as regular as before. It's been a bit of a wait, but the ESA have released the Phobos Flyby images. 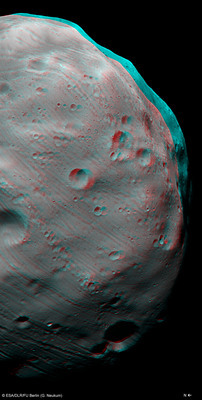 There's high resolution images of Phobos, in normal and 3D versions (the example is a red-green anaglyph at medium resolution, the full size version is pretty nifty), plus animations and close-ups of the proposed Russian missions' landing site. For more updates see the Mars Express Blog. The First Quarter Moon is Tuesday March 23. Mars has faded but is still easily visible. Saturn is at its biggest and brightest on Monday March 22. It is seen in the evening above the eastern horizon near the bight stars Regulus and Spica. Venus appears low in the twilight. Jupiter is visible in the morning sky. The First Quarter Moon is Tuesday March 23. 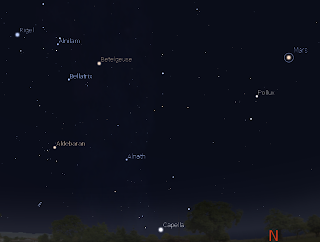 Saturn is visible low in the late evening sky as the bright yellow object between the bright stars Regulus and Spica. Saturn is rising around 8 pm local daylight saving time, and is easily seen in the east in the late evening sky. Saturn is at opposition, when it is at its biggest and brightest, on Monday March 22. Now is the best time for telescopic observation of the ringed world. Bright white Venus continues to rise above from the twilight glow. People with flat, level horizons and good eyesight can see Venus above the western horizon half an hour after Sunset. On the 18th, the thin crescent Moon is near Venus. 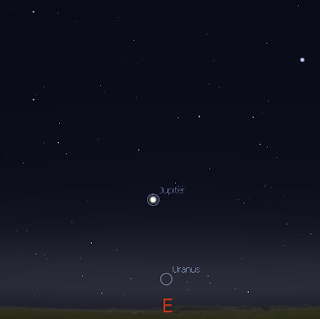 Jupiter reappears in the morning twilight, but is difficult to see without a flat, unobstructed horizon. Western horizon showing Venus and the Moon at 7:45 pm local daylight saving time (6:45 pm non-daylight saving) on Thursday March 18, click to embiggen. In the evening Mars can be seen low in the northern sky as the brightest (and clearly red) object in that part of the sky. Now is still a good time to look at our sister world in a telescope. Shortly before 10:00 pm local daylight saving time (9:00 pm non-daylight saving time) Mars is at is highest in the sky, this is the best time to look at Mars in a telescope. Mars is a distinct nearly full disk in a small telescope, although somewhat small. Larger telescopes will be needed to distinguish surface features. Red Mars is in the constellation of Cancer, nearly halfway between Pollux and the Beehive Cluster. Mars also forms a line with the bright stars Sirius and Procyon. 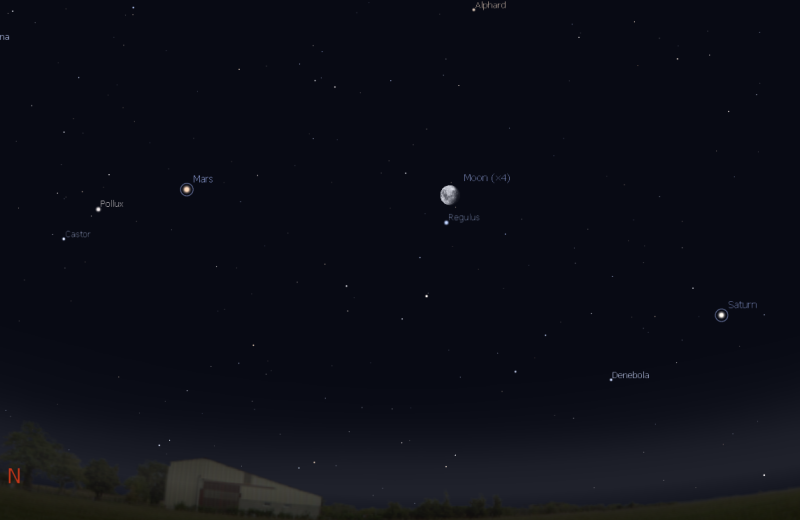 On Thursday March 25 the waxing Moon is close to Mars. Well, I've been virtuous and I've done my Globe-at-Night Report. Mind you, the weather has been awful (those people flooded out in Queensland, or who had their houses/cars trashed in Melbourne may not feel very sympathetic). So far, there are only 3 reports from Australia (including mine), which isn't surprising given the weather we have had. But it's clearing up now, and the survey ends on the 16th, so why not step out and have a look when you can (don't forget to allow some time for your eyes to adjust after coming from indoor lighting). Carnival of Space #144 is here. Carnival of Space #144 is now up at Discovery News - Space. Lots of Spacey Goodness here, it has an academy awards theme, with best pyrotechnics in space, most convincing galactic cannibal and much, much more. Rush on over and add to the applause. Way to stay classy, South Australian Labor Party. In a election advertisement I saw last night the Labor Party is wittering on about how it is tough on drug crime (with a picture that says 100 dead from ecstasy in the back ground - more about this figure later). It then cuts to the Opposition Liberal leader, Elizabeth Isoble Redmond, saying "Ecstasy is not as bad as some other drugs" and then the add voice-over says. "Not Bad Ms Redmond?" with the clear implication ecstasy is really, really bad. Apart from the out and out quote-mining (Ms Redmond is quite right to say ecstasy is not as bad as other drugs, see below) which is obvious to anyone with a greater than room temperature IQ, the add is playing off a visceral fear of drugs, not on reality. MDMA (Ecstasy) can by itself cause death or serious harm, and a big problem is that occurrence of the harm is unpredictable. To put this in perspective though, and in terms of Labours advertisement and Ms Redmonds' statement, in the five years from 2001 MDMA was associated with 82 deaths in Australia (where does the Ad get 100 from, and why are they using this figure? for another perspective see this report). The number of MDMA users in Australia is not clear, but around 10% of 14-19 year olds and 6% of 20-29 year olds use the drug at least once a week (around 20% take it once a month). This gives a crude case fatality rate in the region of 0.01%, not dissimilar to that of the pain killer paracetamol (around 0.01% for UK and the US, can't get Australian figures). Both of these figures are distorted (multidrug use for MDMA and use in suicide for Paracetamol), but at least for acute ingestion, MDMA and the OTC analgesic paracetamol have similar toxic event incidences. Another way to look at it is that it has been estimated that roughly 100,000 MDMA containing pills are consumed each weekend. This means that (over 5 years, if the MDMA consumption figures are correct to within an order of magnitude) there is one death for every 320,000 pills consumed (or 1 in 390,000 if we only look at cases where we are sure that MDMA was directly involved), so while deaths are relatively rare, they occur at an appreciable rate per pill . Yet another way to look at it is to compare Ecstasy deaths with deaths from Heroin. The death rate for heroin users per million population, (death rates for all opioids but primarily heroin, with some opium and morphine deaths) in the 15-24 age group - where the majority are first time users/recreational users not dependent users - is 13.3 per million population, the death rate for ALL age groups using ecstasy, including new, recreational and long time users is 0.8 per million population. This really needs to be adjusted for the user base. In 2004 roughly 6 times more people tried ecstasy than heroin (and 6 times more people used ecstasy within 12 months than heroin). Even if we consider only 20% of the 15-24 age group deaths were first time/recreational deaths to heroin alone the result is still around 1 in 100,000 users. This will be an underestimate of all first time/recreation use. Ecstacy is a drug associated with risk. Whether the risk/benefit ratio (feeling good with MDMA verses removal of pain with paracetamol) is similar is a matter of debate. And while the risk is low it is very unpredictable.Still Elizabeth Isoble Redmonds' statement is 100% correct, and the Labor Party ads are pure scaremongering. Educating people about these risks, given that people can wave away relatively high risks and yet run screaming from safe interventions like vaccines, is very problematical. Having the Labor Party, supposedly the Party of the Light on the Hill, producing such hysterical ads which play to peoples fear is beyond disappointing. The New Moon is Tuesday March 16. Mars has faded but is still easily visible. 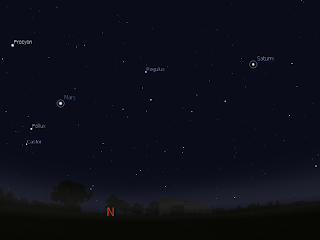 Saturn is now seen in the evening above the eastern horizon near the bight stars Regulus and Spica. Venus appears low in the twilight. The Globe at Night sky survey ends. Jupiter is visible in the morning sky. Morning sky looking east showing Jupiter and the thin crescent Moon at 6:45 am local daylight saving time (5:45 am non-daylight saving) on Monday March 15. Click to embiggen. The New Moon is Tuesday March 16. The Globe at Night sky survey ends this week . 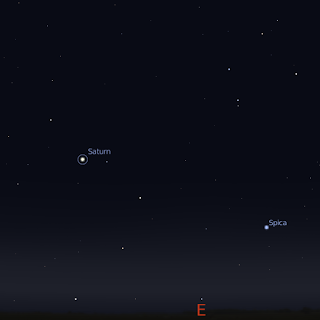 Saturn is visible low in the late evening sky as the bright yellow object between the bright stars Regulus and Spica. Saturn is rising around 8 pm local daylight saving time, and is easily seen in the east in the late evening sky. However, it is best to wait until 11 pm or midnight, when Saturn is quite high in the sky for the best telescopic views. Saturns' rings are opening, and look quite beautiful, even in a small telescope. In the evening Mars can be seen low in the northern sky as the brightest (and clearly red) object in that part of the sky. Now is still a good time to look at our sister world in a telescope. Shortly before 10:00 pm local daylight saving time (9:00 pm non-daylight saving time) Mars is at is highest in the sky, this is the best time to look at Mars in a telescope. Mars is a distinct nearly full disk in a small telescope, although somewhat small. Larger telescopes will be needed to distinguish surface features. Red Mars is in the constellation of Cancer, nearly halfway between Pollux and the Beehive Cluster. Mars is at a standstill for this week. This isn't a rainbow, but a 22 degree halo. It's a bit hard to see (click to embiggen) as it's faint on the image, but was quite clear in the sky. Chez Reynella was at Womadelaide this weekend. In the Rain. SmallestOne was not impressed. True Monday was pretty clear, Sunday was only a bit wet, but Saturday... that was soggy. Still the music was fantatsic, the roving acts amazing and we had a marvellous time. Even got some sky gazing in. Me, enjoying the rain at Womadelaide. Here's an image from the Mars VMC webcam. Nice. There may not be too many images of Phobos, as the orbiter went behind Phobos so it was all dark anyway. Check the Phobos weblog here. The ESA's Mars Express has been doing a series of flybys of Mars's tiny Moon Phobos. This will cumulate on Wednesday March 3 20:55 UT (Thursday morning 7:55 AEDST, 7:25 ACDST, 5:55 AWDST in Australia) with the probes closest approach of 67 Km from the 22 Km wide moonlet. You can keep up to date on the flyby at the Phobos flyby blog. Not only will this close pass give us stunning images of Phobos, but will return valuable data about its mass, composition and paves the way for other missions to Phobos. Globe at Night Starts Tonight. Just a reminder that Globe at Night the survey of light pollution around the world (and getting people engaged with the sky)s tarts tonight, running from 3 March to 16 March. All you need to participate is a pair of eyes and the ability to go outside and look up an hour after sunset. Get involved, get the kids involved! Remember, you will have to let your eyes adapt for about 5 minutes before counting the stars in Orion, so while you waiting, take in the splendour of the sky, and maybe even watch for a satellite. Carnival of Space #143 is here. Carnival of Space #143 is now up at the Next Big Future. It doesn't have cute, hand drawn space Pokemon, but it does have a freaking fantastic avalanche on Mars, bad science fiction movies, Uranus, Neptune, how to stop your near-light spaceship being destroyed by space junk and much, much more. Run, don't walk, over there right now and have a read. The Last Quarter Moon is Monday March 8. Mars has faded and is now the second brightest object after Sirius in the late evening sky. Asteroid Vesta is still bright. 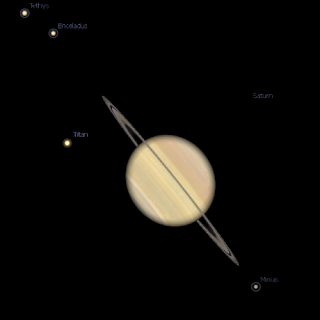 Saturn is now seen in the evening above the eastern horizon near the bight stars Regulus and Spica. Venus appears low in the twilight. The Globe at Night sky survey has started. Evening sky looking east showing Saturn at 10:00 pm local daylight saving time (9:00 pm non-daylight saving) on Friday February 9. Click to embiggen. The Last Quarter Moon is Monday March 8. The Globe at Night sky survey has started. 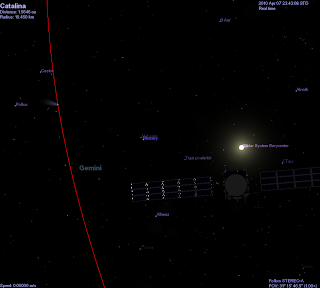 The asteroid Vesta is visible in binoculars not far from Regulus in the Sickle of Leo. It is just within a binocular field of Gamma Leonis (see Mars diagram below, this PDF map and this description of the opposition of Vesta). Vesta is still bright this week and can be seen easily in binoculars. Over the week you can see Vesta draw further away from gamma Leonis. Northern horizon showing Mars and the Moon at 10:00 pm local daylight saving time (9:00 pm non-daylight saving) on Friday March 5, click to embiggen. In the evening Mars can be seen low in the northern sky as the brightest (and clearly red) object in that part of the sky. Mars was at opposition on January 30, but now is still a good time to look at our sister world in a telescope. Shortly before 10:00 pm local daylight saving time (9:00 pm non-daylight saving time) Mars is at is highest in the sky, this is the best time to look at Mars in a telescope. Mars is a distinct nearly full disk in a small telescope, although somewhat small. Larger telescopes will be needed to distinguish surface features. Red Mars is in the constellation of Cancer, nearly halfway between Pollux and the Beehive Cluster. Mars is at a standstill for this week. On February 18, 1930 Clive Tombaugh noticed a faint dot jumping backwards and forwards in his blink comparator plates, we know know that dot as Pluto. The Astronomical Society of the Pacific has the story of Pluto's discovery in Clyde Tombaugh's own words. Go have a read of this fascinating moment in astronomical history, as seen by the man who witnessed it.